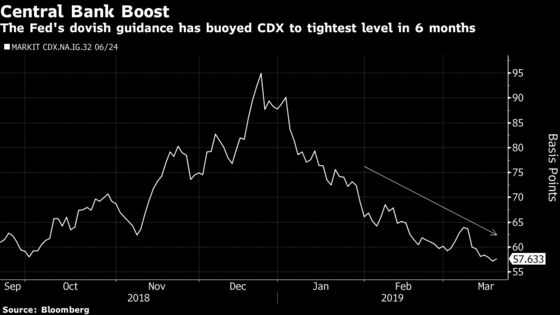 (Bloomberg) -- Thanks to the Federal Reserve, the riskiest and largest part of the investment-grade bond market is about to grow even bigger. The Fed doubled-down Wednesday on its shift away from raising rates, sending benchmark yields to the lowest levels in more than a year. And that’s going to force investors into the riskier corners of the markets as they hunt for better returns, according to analysts. Investors are going to be on the hunt for yield and they will have to either move out in maturity or down in credit to find it. 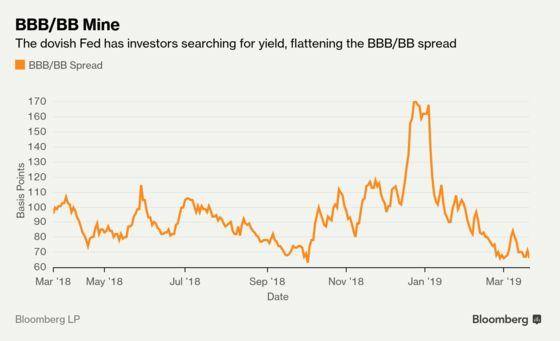 They will likely buy even more BBB rated debt, which already makes up around 50 percent of investment-grade bonds and is the tier just above of junk, because the sector is seen by many as providing a lot of bang for the buck -- a higher yield for lower risk. This should be a boost for BBB rated credits which came under scrutiny late last year when General Electric Co. came into focus due to its large debt pile. With interest rate increases off the table for now, companies like Alcon Inc., which will pay a one-off dividend of $3 billion to its former parent Novartis AG and raise $3.5 billion of debt to finance the transaction in 2019, will have easier access to the market. S&P Global Ratings issued a BBB rating to Alcon and its senior unsecured debt. Also M&A acquisitions could be a big driver with a lower cost of capital. Fidelity National Information Services Inc., for example, plans to buy Worldpay Inc. for $34 billion in a transaction that could have it borrow $11 billion. FIS said it plans to maintain its BBB credit ratings -- two levels above junk from all three major credit ratings firms -- and pay down debt quickly after the deal closes. As a result, corporate bond curves should flatten and the spread of BBBs to BB debt should narrow, as the allure of higher yielding bonds becomes even more attractive. This relationship was first seen after the Fed’s January meeting and has only strengthened after the central bank doubled down on the dovish guidance. “The steeper Treasury curve supports spread curve flatteners - in the back end after the initial weakness is digested. With lower rates investors need even more BBBs,” Bank of America analyst Hans Mikkelsen wrote in a note Wednesday. The search for yield is already showing up in exchange traded funds. 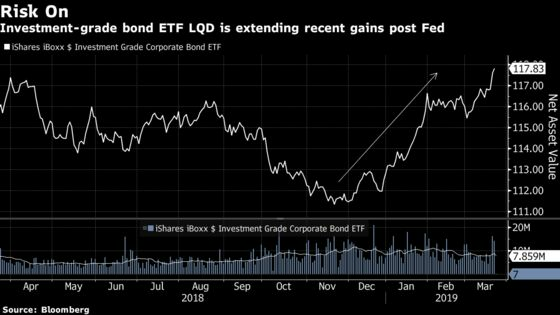 LQD, the high-grade bond ETF, rose to the highest level in over a year, and is extending gains today. Also, IG cash spreads closed at the tightest level since early November, bolstered by robust fund inflows of over $5 billion for the week ended March 20, according to Lipper, the largest in two years. Companies tapping the debt market have been paying less to do so, no matter what their credit rating. This is a turnaround from December when less than $9 billion was priced, making it the slowest December in 23 years. The Fed is “giving the market everything they want and then some,” said Krishna Memani, chief investment officer and head of fixed income at OppenheimerFunds. 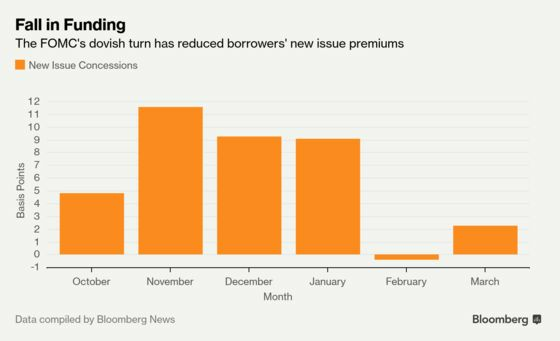 So-called new issue premiums -- the spread differential between where a new bond is sold relative to the issuer’s credit curve -- were in the double-digits late last year. This month, the measure is in the low single digits, and it even went negative in February, showing just how cheap the costs have become. The tide shifted immediately following the Fed’s January meeting. Split-rated Micron Technology Inc. was one of the first companies to command a better price when it sold bonds in February pricing more than 20 basis points inside fair value.